Having never lived in the far north, nor even visited there, I can't attest to the accuracy of life north of 60, as depicted in Late Nights on Air. 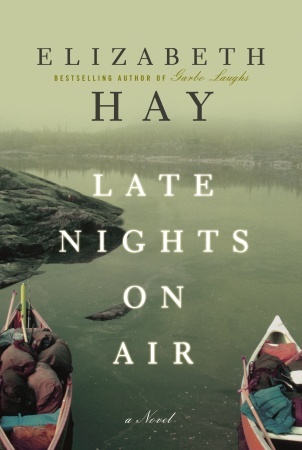 Hay's portrayal of 1970's Yellowknife, an isolated northern community to which only oddball or adventure-seeking southerners ever venture, does feel well realized, even though some depictions of native characters feel stereotyped and social issues feel cliched. Late Nights on Air tells the story of a small northern radio station, peopled by an odd mix of characters who have been thrown together through the vagaries of fate. Harry, the curmudgeonly station boss, is escaping his demons and his fall from grace in southern Canada. Gwen, fascinated by stories of northern exploration she read as a child, longs to retrace the trails of doomed explorers through radio documentary. Dido, an exotic and polarizing possessor of a perfect radio voice, plays people against each other with dark sensuality. Thrown into the mix are the volatile and dangerous Eddy, the lovable romantic Ralph, the spiritually-awakened Eleanor, and the wise and pragmatic Theresa. Against the backdrop of the Mackenzie Valley pipeline inquiries, issues of racism and violence, and the threat of a newly-planned television station displacing the importance of the small northern radio station, four of the characters - Harry, Gwen, Ralph, and Eleanor - set out on a lengthy canoe trip. This fateful canoe journey is the strongest part of the book, and Hay's depiction of the astonishing landscape of the Barrens makes me realize that I know nothing of the mysterious far north. I enjoyed this book, but it didn't particularly move me. It unfolds rather slowly, which is not necessarily a bad thing, but I did have an issue with Hay's overuse of foreshadowing of a particular tragedy. Hay warns of the upcoming event for so many chapters before it actually happens, that I stopped paying attention. Late Nights on Air is an enjoyable read, and I learned something about early arctic exploration, and about the geography of the far north. Ultimately, though, I didn't care enough about the characters to revisit them after I closed the covers. I've never been able to speak to the authenticity of LNoA. It's not the Yellowknife I know, but then it's also set in the 70s, so maybe it would be accurate for that time. Of course, you could always visit and compare notes! I read this book a while back as well. I really wanted to like it, but I don't think the characters were all that well developed and I too thought the plot-work was obvious. Just Ok. I read this as well and, as I really like Elizabeth Hay's writing, I convinced myself that it was great. I did have some of the same reservations about the foreshadowing though. Life in Yellowknife in the 70 's was a stereotypical northern town, at least when I was there. The north, at that time, was not as developed as the south for the obvious reason of isolation and it truly attracted some really interesting and colourful characters that one does not normally encounter in southern towns. Being from a northern town, I can attest that it was a whole lot different from the south, especially in it's social culture. Native stereotypes exist partly because they have a basis in fact - not much fact (many times exaggerated in most cases) but some do have a kernel of truth - perhaps that is why we still have them and they are so hard to shake. They are not unlike the farmer stereotypes that still exist today. That said, I agree that character development would have added a depth to the novel that was missing. For me, the characters must be complelling in some way unless excellent writing overrides them. That's the best rationale I have ever heard for taking a trip to Yellowknife, John, with the secret agenda being to hang out with the Mutfords, of course. Yes, just okay describes it well, Mr Anchovy. I do want to read some of her other books, though, as comparison. Good assessment, Kathy. I particularly appreciate your first-hand experience with the reality of Yellowknife in the 70's, from your northern perspective. I agree, Leaz. I can put up with a less than stellar plot if the characters are well-drawn. Very true, Al, "meh" being just one step above "bah". This is considerably more enjoyable than that!